Last week, I decided to be proactive & deal with my soon-to-expire drivers license. Brother told me what Tom had told him – waiting in line FOR-ever at the Galletti NV-DMV is over-rated… so he told me about the NV-DMV Commercial license renewal place thingy on E. Greg. Evidently, the word on the street is that the Commercial Drivers License place also does REGULAR license renewals for Rubes like me. Even better, Brother had spent a total of 15 minutes in the place & finished all the business one could ever want to finish. Ahhh. Sounds like my kind of place. Found it. And let’s just say it was a leettlle bit busier that when Tom & Brother had been there. Waiting room had 10 people in it, (which I know is still less than Galletti on an average day,) so I went to the cool, “Take A Number” station, pulled Lucky 403, & found a seat. And waited. I hadn’t brought any of my normal time passers with me (books, chocolate, portable coffee, or wasser mit kohlensäure) so I went into introspection mode, which unfortunately lasted only about 37 seconds. Done with that, so I decided to look around the room & ‘observe’ the other individuals that were sharing the space that I had mistakenly assumed would be empty. I watched from the corner of my eye as their communication became more animated – it became apparent that the woman was scared… she had to take a vision test for her license renewal, & it was obvious she didn’t think she’d pass it. The anxiousness & worry became more pronounced as she got closer to her turn at the vision-apparatus. The man touched her arm gently & made “Shushing” noises… not the “be quiet” ones, but the kind you make to comfort a crying baby. Her body stiffened when her number was called; she sat in the chair in front of the machine, & he sat next to her, his hand on her back. She took the test & passed. She was relieved. Now to get the picture for the new license. They walked together to the area where the new pictures would be taken – she was self-conscious – I saw her look disapprovingly at herself, her clothes, & run her fingers through her hair – the signs of sadness, not wanting to get her picture taken. The eyes that had been downcast, preoccupied, & self-conscious glimmered & sparkled with the confidence that comes from being loved by someone, that comes by choosing to believe that what you’ve just heard is the God’s honest truth. She sat & smiled for her picture, then arose, took the man’s hand, & they walked out together. I’m not pregnant, but I’m nesting. Went through the pantry with theBean. Swept it. Through away stuff with shelf life that ended in 2007. Truly. Today, I decided to tackle the freezer, since theBean was headed for Shift #2 on the day. 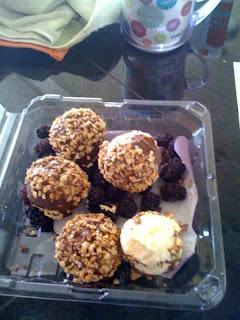 Went through the freeze-dried foods, the unwrapped icy-treats, & other stuff that one finds in the freezer. Then, I came across some Drumsticks. You know, that incredible tasty ice-cream treat that sits on a sugar cone, covered with quik-dry chocolate & peanuts? Well, what I found were the ‘heads’ of the drumsticks. Turns out, the cones had all be eaten, & some kind soul had placed the drumstick heads back into the freezer for anyone that might want the leftovers. Went to the Hand Dr. for I-Doey. 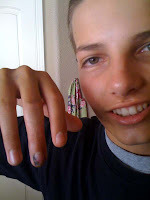 Got the stitches out. Looks good – like he’ll be able to start in with his summer weights & football stuff tomorrow – just no contact drills for the next 3 weeks, at which time more X-Rays will be taken to check on the progress of young I-Doey’s finger. We’re hoping, praying & believing for a complete recovery, without any of the finger-hypersensitivity that the Dr. said might be a possibility. Here’s to healing. Woohoo! According to my 2 oldest children, I may be showing signs of getting smarter. Or at least being smarter than they thought I was. I will update you on any more progress I make. 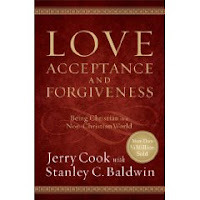 I’m ecstatic – the book re-release that I’ve been waiting for is finally here… Jerry Cook’s classic, Love, Acceptance, & Forgiveness: Being Christian in a Non-Christian World came out last week. This has been one of the books that has most formed my outlook on life, the Church, & my view of God. If you have never read it, by all means, get a copy & do so. If you have, get the re-release today. It is the classic you remember that has been brought up to date & made even better… its even got a ‘study guide’ included in the back. Thinking about how thankful I am that the Bible doesn’t need to be updated. I believe that we’re on the brink of something large. A fundamental shift in the way we live, work together, & carry out life. Not trying to come up with the Next Big Thing, but rather trying to cooperate with what I believe are the doors that are opening in front of us. New ways of doing my job – new roles, with other things not happening any more. Trusting that God has provided & will provide for what comes next. Thankful I don’t have to have all the answers, but just do my part. And encourage others to do the same. Wherever they are. Cryptic enough? I think I’ll go eat some more chocolate off the Drumstick heads. I’d like to ask a favor of you – reader of this blog, the readers that I know, the blog-lurkers that I don’t… even the random person that stumbled across this page in a chance Google search or ‘go to next blog’ moment. And the times, they are a-changin’. Again. Big changes are afoot in the greater organization I & our church family are apart of… What’s happening seems to be a realignment. This should make life over the next few months a bit interesting.